Want to let your PDF sales catalogues, brochures get attention from more people in the world? You definitely need to convert PDF to SWF file. Why? Because Flash Player which is specially created for SWF display has a wide user base, with over 90% penetration on internet connected personal computers. Converting PDF to SWF will enhance the accessibility of your PDF file. What's more, swf allows streaming which enables your PDF content to display through any browser smoothly. Actually, it's an easy job to convert your PDF file to SWF and share it with the world. 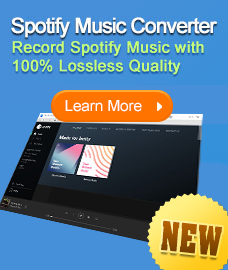 All you need is just a handy free PDF to SWF converter. Here we will have a brief analysis for several PDF to SWF freewares as below, to review their pros and cons and see which can best suit your needs. Have a Mac, and want to convert PDF to SWF? 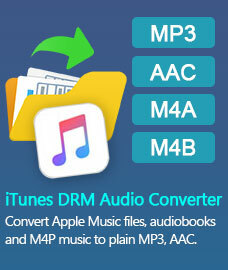 You can simply use PDF to SWF Converter for Mac to make it! Some people would prefer converting PDF to SWF online. Take aXmag as an example. The advantage is that you don't need to download and install any file, just upload file to the website, fill your email address and then click "upload & Convert PDF", then your conversion will process. What's worth mentioned is that this website also offers option for converting internet PDF. Disadvantages: There's 10MB limit for the PDF file. And you need to use your email to subscribe their website for more settings. If you feel uncomfortable to upload file to their website and want a desktop version, you need to pay $380 for a licence of standard desktop version. 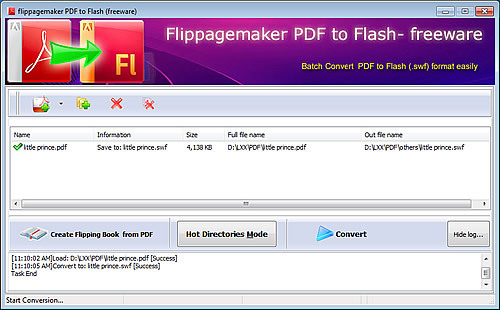 FlipPagemaker PDF to Flash is a fast converter. This freeware includes a Hot Directory Mode which enables user to process conversion more quickly and automatically. User just need to define the input, output directory and log file path. Then the PDF files in input directory will be converted and sent to output folder automatically. Disadvantages: The options inside the program are very limited. Apart from the add, convert button and the Hot Directory Mode Panel, you can't find other custom options for the output. Though the layout of the PDF content is retained, the text is too small and sometimes even turn out to be random code and totally unreadable. This freeware will easily catch your attention, because there are lots of custom setting inside. You can define whether to output compress flash6 format, whether to allow SWF automatically play, adjust image quality, specify converted page. etc. It can also convert password protected PDF file. Disadvantages: Before converting, there will pop up a window asking you to upgrade program to a full version. In the output file, there is a website address across all pages. You need to buy a licence to unlock program and remove the ad. Apparently, this claimed freeware which is available on lots of download website is just a trial version. What's worse, the output text is just like that of the program above, very small and all turn out to be in readable random code. User that emphasizes on conversion speed and quality, would probably prefer PDFmate Free PDF to SWF Converter. It supports batch converting mode and can convert multiple PDF files in high speed. The interface of this free PDF to SWF converter is quite simple, but it outputs nice SWF with all layout, format and graphic well maintained. Unlike other PDF to SWF converter, this freeware outputs SWF in delicate format. If you open file in a swf player, you can find a bar on top for scaling, in that case, user can always adjust to needed page size for reading. Besides, there are also full screen button, navigate button and side bar. All these would make you feel that this software puts the user's experience on the first place. Furthermore, it includes other output like HTML, ePub, Text, Word and Image. Disadvantages: It can't convert encrypted PDF file. There are not much options inside program. More custom options like specify converted page range, automatically play, etc are needed to be added. No matter online or desktop, as a free PDF to SWF converter, the basic requirement should be 100% free, easy to use and convert PDF to SWF of acceptable quality and speed. From comparison above, we can see the performance of different PDF converters are various: some limited , some with adware, some even can't work as expect. However, the best depends on what you need. So, what's the best? You can try one by one or you may already have the answer!